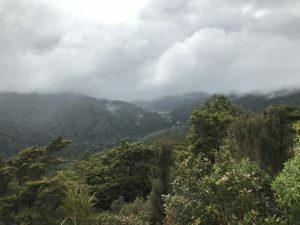 We wanted the chance to explore the Tararua Range when the weather was typically spring like and unpredictable! It was too far to just go for the day and we love the peace and quiet of staying in a rural hut overnight. the hut is at the road end so we could take as much or as little ‘stuff’ as we wanted! there were properly hot showers, one in each of the 2 bathrooms, making a longer stay definitely possible. there were proper flush toilets so no need to ‘hold on’ or hold your breath! a kitchen with lots of supplies e.g. full oven, hob, fridge and freezer as well as pots, pans, cutlery and crockery. lots of flat grassy space, great for cricket, football, tag or even an after dark game of Spotlight! fire pits just next to the river so we could build a fire, roast dinner and toast marshmallows. 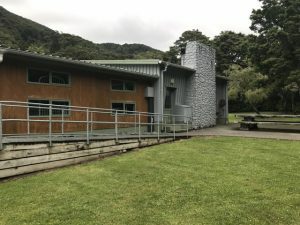 2 rooms (Kereru and Kaka) are single occupancy 4 bunk rooms if you’re not into sharing (there’s also a 20 bunk room meaning total occupancy could be 28. And there’s a camping ground albeit nearer the entrance to the park – great for a big family gathering or multiple family friends). the arrangements of the rooms means that the kitchen/living space is a meeting point in the middle. a friendly park ranger who is happy to give advice on walks etc in the area. there’s a river that runs close by – not great if you’ve got little people that might wonder off, but good for fishing, skimming rocks and there’s even a swimming hole closer to the camping ground. the book for trampers signing in / out is just outside one of the single occupancy rooms which can mean a trail of people stopping near the window from very early in the morning. the cleanliness of the hut, as with all huts, is dependent on how the last occupants left it which can vary wildly. if the ranger isn’t around when you’re wanting to unpack, you’ll have to walk with your belongings from the car park to the hut (around 300m or so). take shoes that can easily be slipped on as the bathrooms are across a grassy area. take some dry wood if you plan to build an outdoor fire in a fire pit. the walk up to the Rocky Outlook on the Gentle Annie track has amazing views over the whole area. While it does go up, it’s a gentle incline and doable for kids that are reasonable walkers. It can take 2 hours return. there’s a pizza joint that opens only on Fridays that makes for an easy and yummy dinner. It’s a good idea to book ahead. Water Mill Bakery, 33 Blakes Road telephone 06 370 1129. For ideas on things to take when staying in a hut in general, have a look here. Holdsworth Lodge is at the road end of Mount Holdsworth Rd, well sign posted south of Masterton. For more details about this DOC hut, including booking, look here.